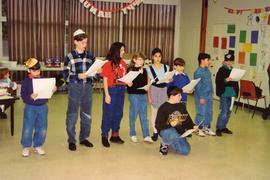 Photograph depicts a group of children singing and reading at the front of a room. 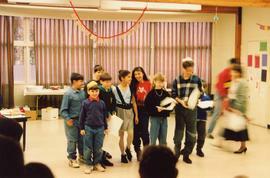 Photograph depicts a group of children standing at front of room. Photograph depicts an unidentified child. Photograph depicts a group of children. Photograph depicts a group of children at front of room. Photograph depicts children putting together crafts at a table with adults. Photograph depicts adults and children putting together crafts at a table. Photograph depicts a group of children sitting around a table with lit menorahs in a school room.